Summertime is a time of year when I do a lot of sewing. When the weather turns I sort through all the girl's clothing and see what can be saved for next year and what goes for donation. Often items need to be mended from wear and tear, or altered for wearing in warmer temperatures. One of my favorite things to do is take the long sleeve shirts that still fit and cut and hem them to become tank tops or short sleeve shirts. 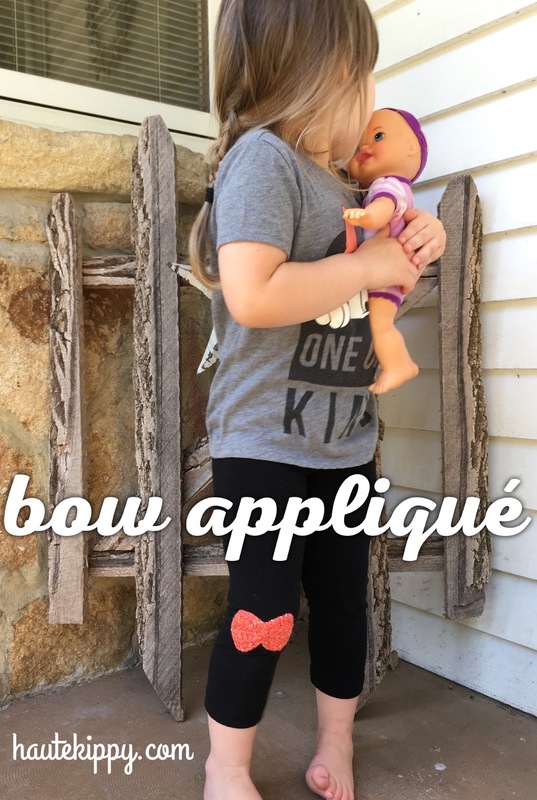 The kids get so excited when their favorite top can be made "new" and worn even longer! It reduces the amount of new clothes that need to be bought and is a fun creative outlet for me. I love to keep my sewing machine out this time of year so I can fix something old, or create something new- any time I want! A pitfall of summer time is the increased outdoor play and the inevitable skinned knees. My kids love their leggings. Most of the time they flat out refuse to wear pants or jeans. Who can blame them, leggings are so soft, stretchy and comfy. But when a little one playing falls down, we often get a hole in the knee of those beloved leggings. After the tears dry, many parents probably wonder what can be done with a perfectly good pair of pants that still looks great, other than a hole in the knee. 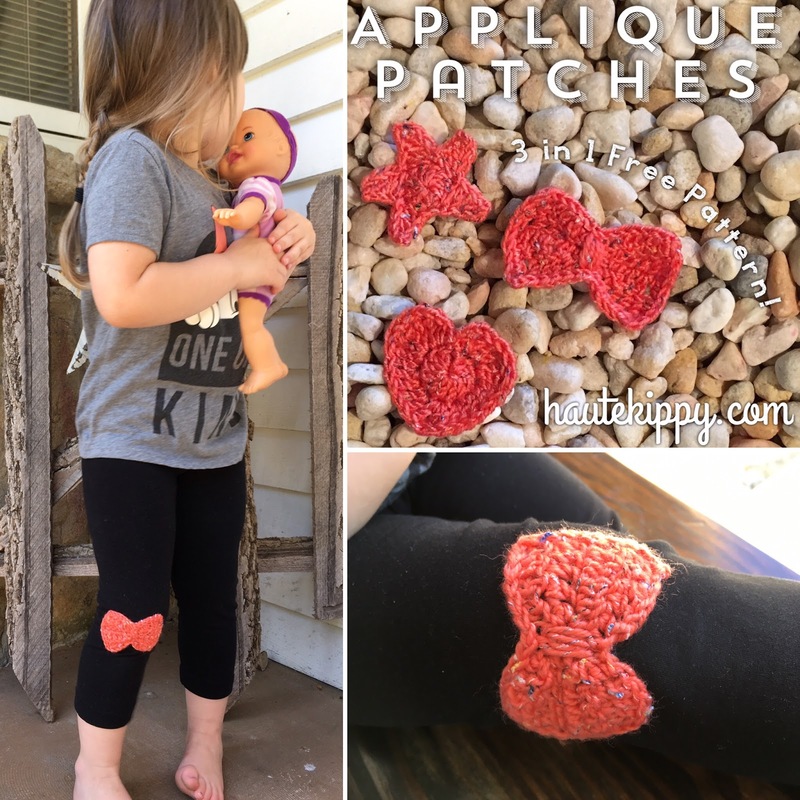 Sure you can throw them away, but why don't you make an adorable patch and sew it on? It's so easy! I have developed easy to follow patterns- three in one- for you to choose from. Mix and match, in different yarns and different colors to make a bow, a heart or a star applique that can be sewn on to cover up any hole in your little one's favorite pants. Get even more creative! Try an applique on your backpack, jazz up a plain t-shirt or even the pocket of a pair of jeans. The possibilities are endless as you play with these fun shapes and their many uses. 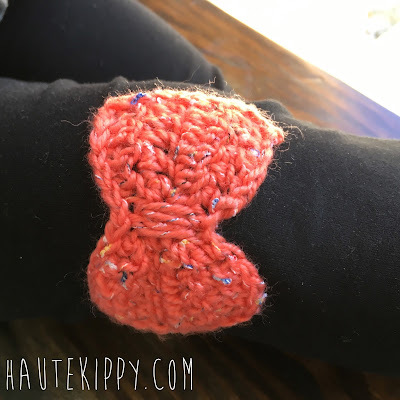 Either DK or wosted weight yarn can be used for this pattern, I used both to show there is only a small difference in the applique's final size. Use a G6/4.0mm hook for either yarn. 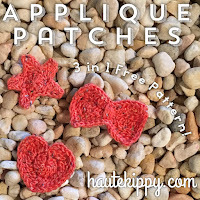 When you've made your desired applique simply treat it like any patch: place over hole in garment to be mended, and using needle and thread, sew into place! 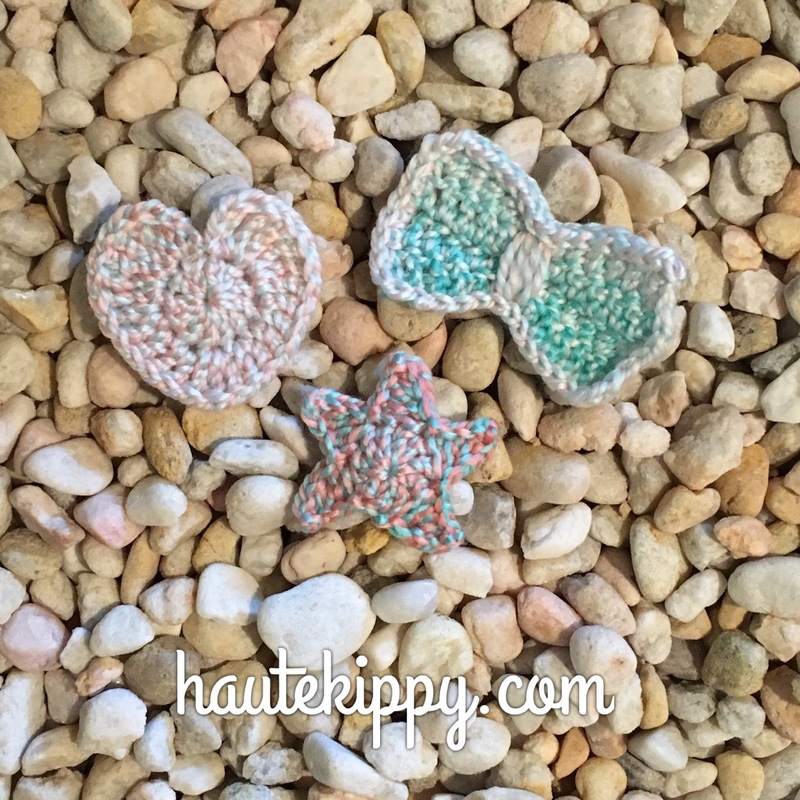 The pattern for the star is a general method, I have seen this way of making a star all over the internet, it is not an original or different method of crocheting stars. I am not claiming that the star design is unique or new. 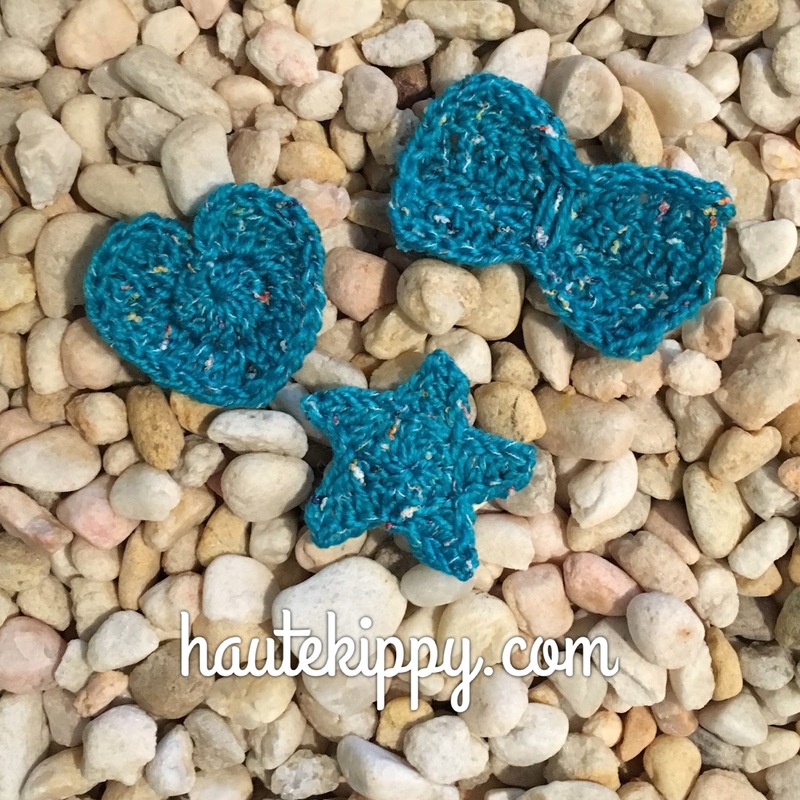 I have simply recorded for your ease of use, the common way to crochet a basic star shape. The heart and bow pattern are however, original works- they turned out simply by my trial and error. You are free to use share and enjoy these patterns but please link to my blog when sharing! Thank you for respecting the integrity of this creative work! Row 1: dc in 3rd ch from hook, dc in next 3 sts, hdc, sc in next 2 sts, hdc, dc in last 4 sts, ch 2, turn. Rows 2-4: repeat row 1 three more times. Edging: at end of row 4, ch 1, pivot work to crochet along raw edge, make 2 sc in the ends of each row across (8 sc), ch 1, pivot work to crochet along foundation row, sl st in each st across (12 sl sts), ch 1, pivot work to crochet along raw edge, make 2 sc in the ends of each row across (8 sc), ch 1 pivot work to crochet along last row, sl st in each st across (12 sl sts, join to corner with a sl st, fo. Finishing: Thread a yarn needle and make 4 vertical stitches in center of bow to form a faux knot. FO weave in ends. Round 1: make 11 dc in magic ring, join to first dc with a sl st. Round 2: ch 3, 3 tr into first st, 3 tr in next st, 2 dc, 2 dc, dc, (dc, tr, dc) in next st, dc, 2 dc, 2 dc, 3 tr, 3 tr in last st, ch 2, sl st in same st. fo, weave in ends. Round 1: make 10 dc into ring, join to first dc with a sl st. Round 2: *ch 4, sc into second ch from hook, hdc in the next, dc in the last ch, skip the next st of the previous round, sl st in the next*, repeat ** around four more times, join to first st with a sl st, fo, weave in ends. 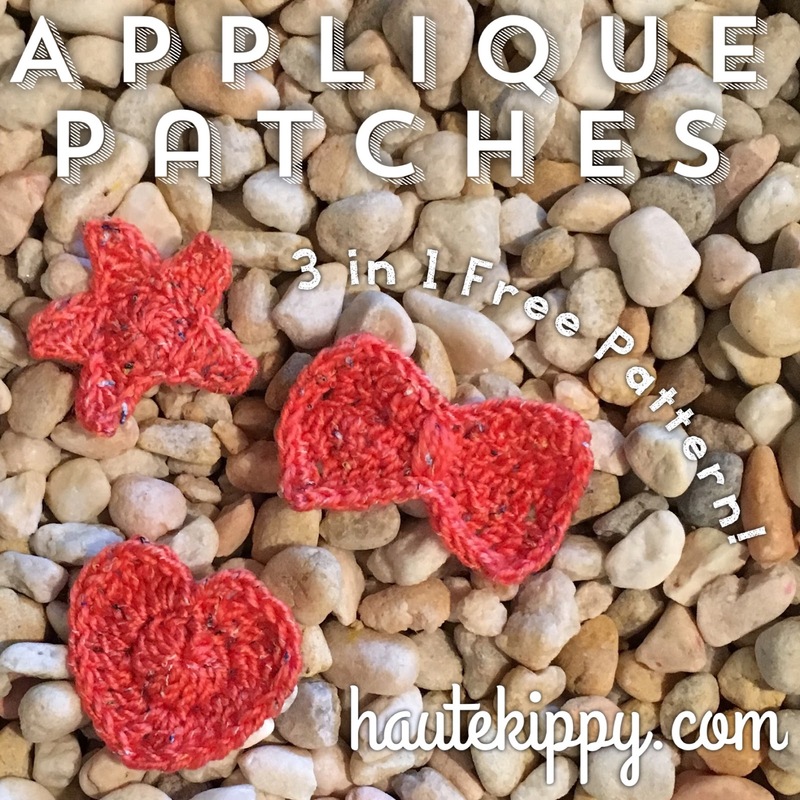 Be sure to like Haute Kippy on facebook, follow me on Pinterest and Instagram and find me on Ravelry! Share a picture of your work on social media #hautekippy. 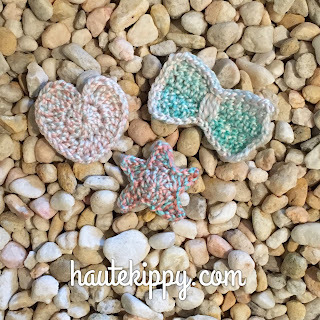 Thanks for sharing this post and for working my crochet patterns and crafts! I heart you!